Along with pollens from trees, grasses, and weeds, molds are a leading cause of seasonal allergic rhinitis. In warm regions, molds may be present year round. In colder areas, the mold season generally runs from early spring until well into the fall, typically peaking during July and August. While most molds, like pollens, are killed by the first major frost, others may persist during the winter months, even in cold regions. There are literally thousands of types of mold. The seeds or reproductive particles of fungi are known as spores. It is usually these spores that actually cause mold allergies. A single mold growth can spawn literally millions of spores. Molds can be found wherever moisture and oxygen are present. Rotting logs and vegetation are prime habitat for molds, as are damp walls and carpet. Some molds attach to certain grasses, weeds, and grains such as wheat, oats, barley, and corn. Molds thrive at room temperature making them troublesome inside the home, where they can often be found in damp basements and closets (in sheetrock, wallboard, and insulation), bathrooms, refrigerators, house plants, air conditioning systems, humidifiers, foam pillows, washing machines, dryer vents, and furniture. Certain workplace environments are also very prone to mold infestation problems. Mold allergies are caused by inhaled mold spores, or inhaled fragments of mold growths. Fortunately, while there are thousands of types of molds, only a few dozen are believed to cause severe allergies. Mold spores may lodge in the pathways of the upper respiratory system or in the lungs themselves and cause irritation. Symptoms of mold allergy are similar to other allergies, including nasal congestion, sneezing, watery and itching eyes, dry tickling throat, recurrent ear infections, rashes, coughing, sore throat, post nasal drip, and breathing difficulties. In some individuals, exposure to certain molds can lead to asthma or to a rare lung disease called allergic bronchopulmonary aspergillosis which is characterized by wheezing, low-grade fever, and coughing-up brown-flecked masses or mucus plugs. Individuals who have mold allergies may be more susceptible to other types of allergies or infections. In fact, some research suggests that exposure to mold allergens could be an underlying cause of many undiagnosed ailments that manifest in symptoms of chronic fatigue, sinus and respiratory problems, and recurrent throat infections. 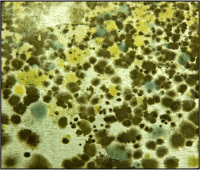 Black (toxic) mold, called Stachybotys, is a particular threat. It is especially toxic and can prove to be a serious health threat, particularly to children with mold allergies. Stachybotys is widespread in the southern U.S. were foam board insulation was used without adequate ventilation. Symptoms of an allergic toxic mold reaction are generally the same as traditional mold allergies, however, they are usually much more severe and could progress to: coughing up blood, nose bleeds, anemia, memory loss, pulmonary hemorrhage, and even coma or death. Mold infestation often occurs after a home is flooded due to heavy rain, river overflow, or internal plumbing failure. To prevent hidden mold infestation inside walls, etc., professional flood restoration contractors are recommended when these events occur. Massive mold colonies quickly grew in homes in the aftermath of Hurricane Katrina in New Orleans and was responsible for significant illness.